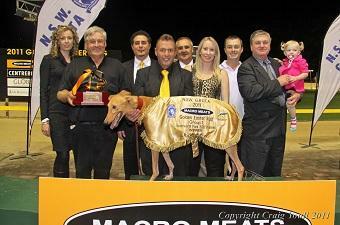 Allen Harper’s victory on Saturday night (June 25), in the Group One Rapidvite Peter Mosman Final gave Victorian maestro trainer Graeme Bate his third Wentworth Park Group title for 2011. Bate, who has already claimed the Group One Macro Meats Golden Easter Egg (pictured) and the Group Two Evans and Son Jewellers Ladies Bracelet this year, added an additional $50,000 to his kitty with Saturday’s sensational 29.58 victory. Brendan Wheeler, son of owner Jan Wheeler, broke in Allen Harper and says that the son of Over Flo x Kazar Bale showed ability while under his guidance, however injuries have hampered the greyhound from reaching his potential earlier. “We knew there was improvement in him (from the semi-final) because he has just done so little two turn work,” Wheeler said following the race. “His potential is limitless, when we broke him in we thought he was the next best thing. “Three weeks ago, just before the heats Graeme (Bate) sent me a text after Allen Harper won a fifth grade race at Bendigo coming from last to just get there on the line. An age restricted classic the Rapidvite Peter Mosman series saw some of Australia’s best youngsters (up to 30 months of age), including Golden Easter Egg placegetter Adam Meway and dual Group One winner Kilty Lad line up in the final, giving connections even greater satisfaction with the win. “Sometimes you can sneak an easy aged classic here and there, but I don’t think that was the case with this one. “We had the red and we used it, we had to in this race because there were some super dogs in it,” Wheeler said. Wheeler was quick to recognise the training effort of Graeme Bate and those who attribute to the overall operation. “Graeme Bate has done it all, and I guess that is why he is now preparing to go oversees and have a go at the Irish Derby. “There are so many cogs to our operation and we rely on so many of them. Allen Harper’s 5 ¼ lengths win over Main Drag and Ruby’s Lair will see him become the events race record holder. The next feature event at Wentworth Park is the GRNSW Country Challenge Showdown and Sportingbet Super Stayers Series on July 8, 2011.